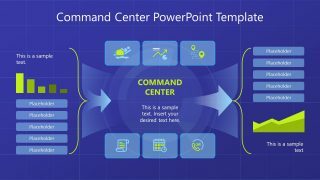 The Command Center PowerPoint Template is a 2-slide infographic layout for presentations of centralized management systems. The template illustrates command center’s war-room in first slide. 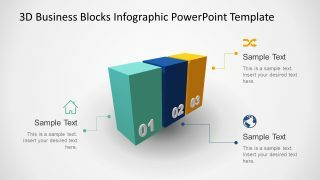 This slide includes 6 flat screen shapes, curved to create a 3D visual and displays 6 infographic icons in each. Although, these infographics visually represent term or concepts relevant to control room data. 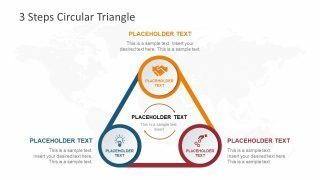 The users can replace these infographic icons with images, charts, or diagrams for detailed presentation discussion. 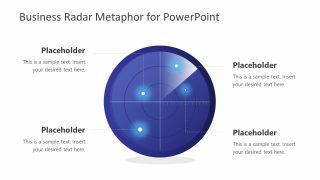 Additionally, a zoom-in feature will enhance the overall presentation outlook. To do so, apply a zoom-in feature from zoom dropdown menu and choose slide option. it will enable users to enlarge each screen’s content and help audience take a closer look. 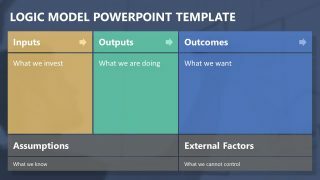 The Command Center PowerPoint Template also provides and concept model diagram slide. This slide assists presenter to explain how information is processed in and out of data command center. Further, this system explains 6 steps process for handling information and reach accordingly. The command centers are often used by government and military agencies to monitor activities like media and public response. Similarly, these centralized centers may assist in responding to inquiries and analyze situations for further actions. 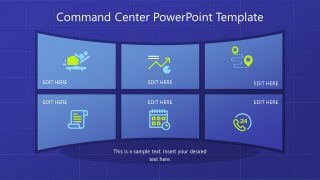 The editable PowerPoint template for command center concepts with a blue theme, infographic shapes, and icons. The users can modify infographic effects like gradients or transparency and turn this theme into modern flat design.